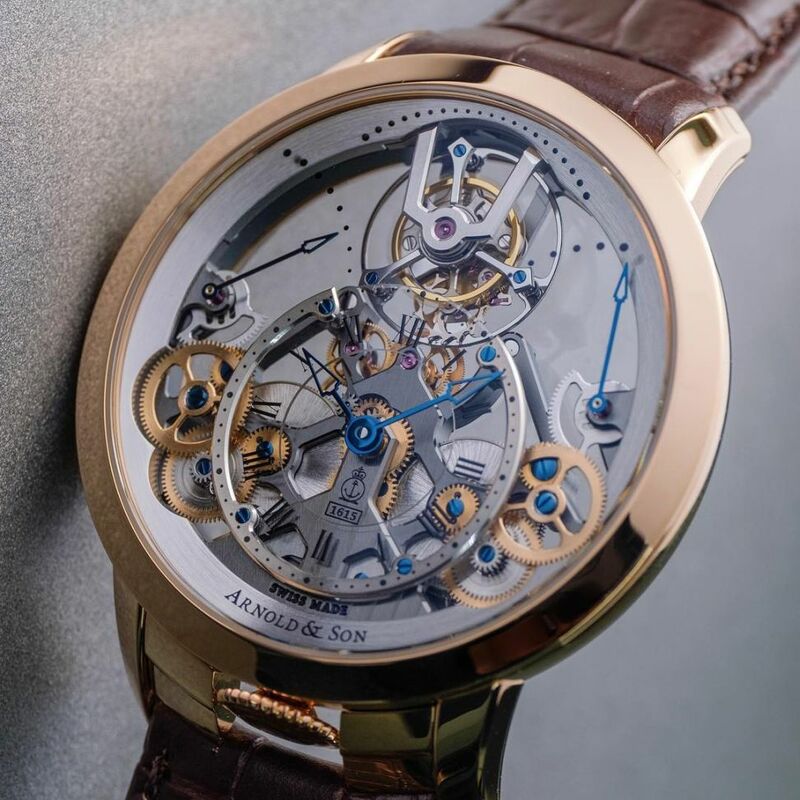 The Time Pyramid is inspired by the regulators created by John and Roger Arnold over two hundred years ago and by antique British skeleton clocks with their recognizable vertical construction and cone-shaped chain and fusee system. The movement is built on three levels. The tourbillon and the two power reserve indicators are superposed by a sapphire crystal dial indicating the hours itself, crowned with a rhodium plated ring for the minutes. This exclusive construction offers a lively-look and three-dimensional face to the timepiece and, to further enhance the balance and symmetry, the crown is positioned at six o'clock. 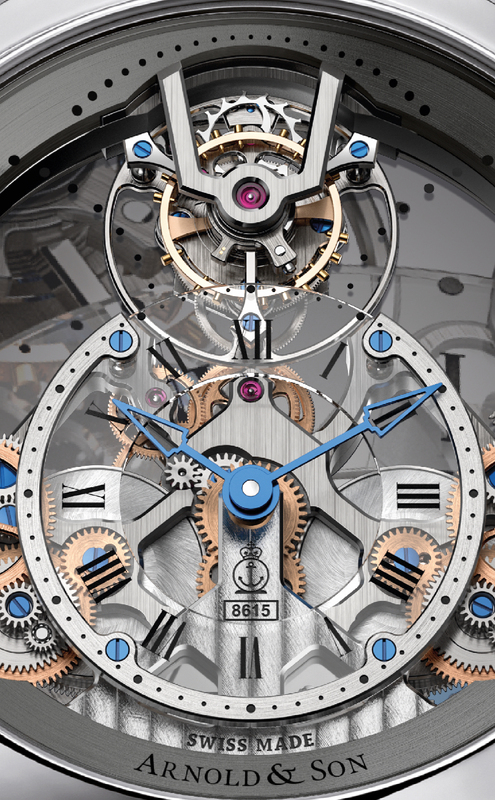 The gear train runs vertically in a linear arrangement connecting the two barrels at six o'clock to the tourbillon escapement at twelve o'clock, giving the movement its pyramidal architecture. The bridges are designed so that all the wheels, the two mainspring barrels, the escapement and balance wheel are all visible from the dial side. 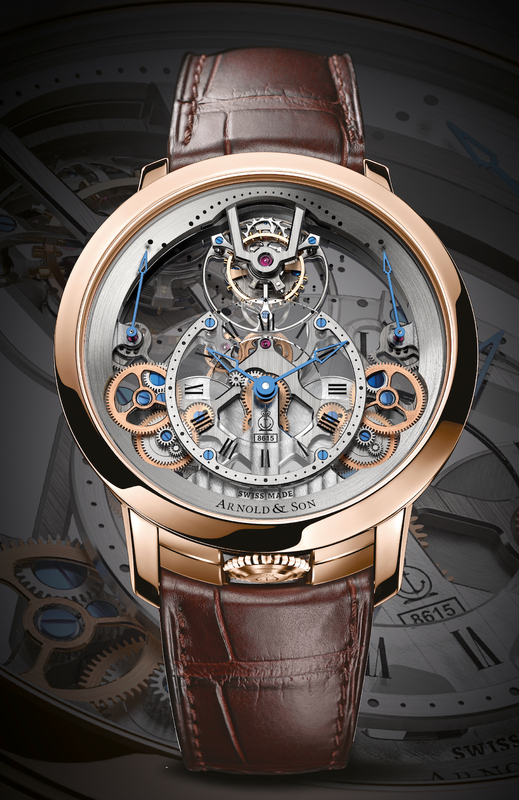 Besides the off-centered hours and minutes, seconds are on the tourbillon and the two power reserve indicators are on each side of the linear gear train. The blued steel hands indicating these power reserves artfully demonstrate how the right barrel takes over when the left barrel reaches a limited power and thus, to maintain an optimum and accurate functioning. The two serially set up barrels supply the in-house manufactured calibre with a total of 90-hour power reserve and provide a more regular force to the wheel train. The case, in 18kt red gold or in stainless steel, measures 44.6mm x 10mm. It has double AR-coated sapphire crystals and it is water resistant to 30 meters. Movement is the Swiss manual-wind Arnold & Son in-house caliber A&S8615 with 31 jewels, 21,600 vph and a power reserve of 90 hours. 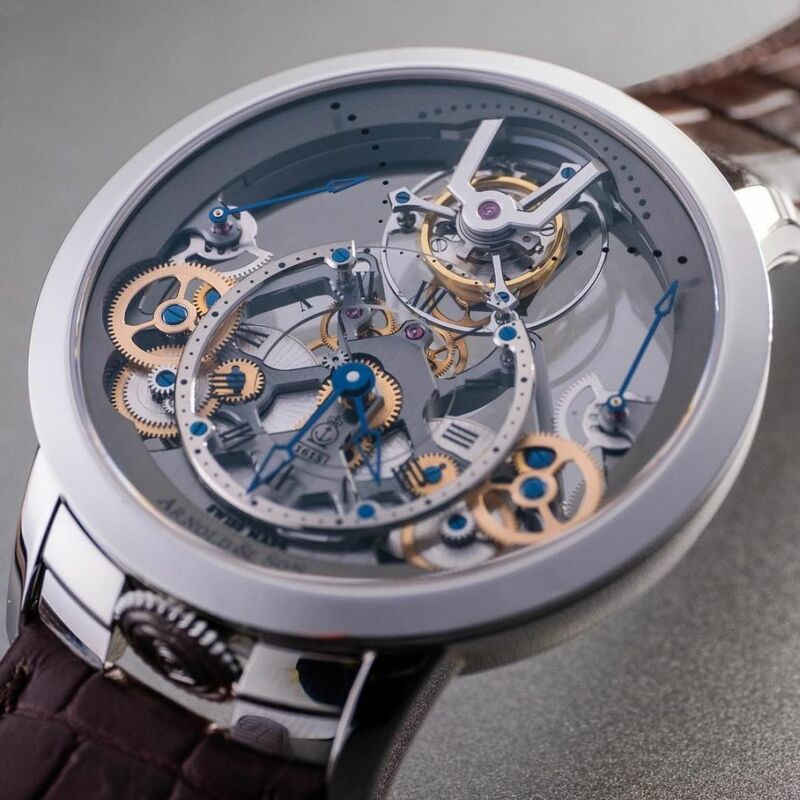 It features a skeletonised movement with Haute Horlogerie finishing: chamfered bridges with polished edges, Côtes de Genève, satin-finished with polished edges main plate, circular satin-finished and chamfered wheels with A&S three-spoke design, polished edges, and blued screws. Tourbillon cage: satin-finish with chamfered and polished edges, top bridge and cage plate circular satin-finished and mirror-polished by hand. Functions	are: hours, minutes, seconds on tourbillon, and power reserve indicators. The dial shows the hours on a sapphire disc and minutes on a rhodium plated ring. It comes on a black or brown hand-stitched lligator leather strap with a steel or an 18kt red gold pin buckle. MSRP is 37,150 to 46,800 Swiss Francs.